Intro from Jay Allison: Atlantic Public Media keeps experimenting with Google Earth as a storytelling tool. This time we picked the Monarch Butterfly Migration as the story. Transom asked the creative team of Ari Daniel Shapiro, Eduardo Garcia Milagros, and Josh Kurz to describe their process—the challenges and opportunities of mapping narrative. The team will be around to take your questions. How was being involved with this particular collaboration similar to and different from the way you’re used to working? Ari Daniel Shapiro: I’m accustomed to writing radio scripts, and using audio as my primary medium. This collaboration required me to think visually about how the audio could work in relation to the map. I had to work out which audio elements would best serve and be enhanced by the map interface. 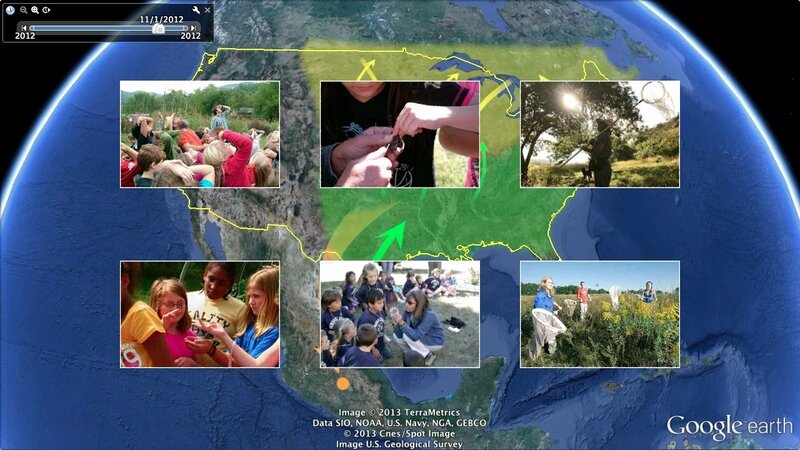 For instance, I received audio submissions from many citizen scientists across the country. I selected which ones to use in the story based both on what they had to say and their geographic diversity, since pivoting the map between places that are far apart is more interesting to watch. In addition, as I wrote my script, I added a set of accompanying stage directions – visual notes about what photos to include and what part of the map to view, and musical notes about the kind of scoring that might work in different sections. Eduardo Garcia Milagros: The most exciting part for me was to figure out how to design the animations to match what was described in the script. It was really fun and challenging. The more I work with the programming language to create these tours, the more I like it. When I’m able to transform an idea into a Google Earth animation, it makes me really happy. For instance, animating Josh’s graphics was a healthy challenge for me, and I think those visual elements added a special touch to the tour and improved the viewer’s experience. What did you enjoy about the process of making this tour? What could have been better? Ari: I enjoyed fusing the academic science and the citizen science in this tour, and thinking about the best way to depict that fusion on the map. Before I started writing the script, I wasn’t sure the best way to tell the story of both the butterflies and the people. Eventually, I realized it made sense to start the story in Mexico and flesh out most of their migration journey in the first half of the tour. I concluded the tour with their return trip after showcasing a handful of citizen scientists and their projects. I also enjoyed watching the audio come to life on the map, through iterative editorial rounds with Eduardo. I sent him the audio mix, and he would develop a section of the tour in Google Earth, and send me a file to view it. We went back and forth at least a dozen times with each section to get everything just right. Why bother with Google Earth tours? What did this medium allow you to do (narratively, creatively) that you couldn’t have done in other multimedia formats? How did it enhance the kind of work you usually do? Ari: Describing where monarch butterflies fly, when they do so, and the challenges they face along the way using only words and no images or maps is a challenge. The medium of a Google Earth tour works especially well here because the story is so intrinsically visual and geographic. I can also imagine a story like this dovetailing nicely with a separate set of interactive geo-data layers with information about monarch butterflies, conservation programs, and citizen scientists that users could explore on their own time. Eduardo: I agree that Google Earth is a powerful communication and education tool. It’s important to show and explain concepts that have a geographic element. And I think we haven’t reached its limits yet. Josh: The use of animated maps to explain concepts or tell stories is nothing new. What Google Earth offers is a set of interactive maps that tap into a vast database of information. When utilized well, I think Google Earth offers an economical way to create complex visualizations that incorporate a lot of information in a clear and presentable way. Do you have a wish list for things you hope this storytelling tool will do in the future? Ways it will become easier to use? Ways it could become even more robust? Josh: This tool has incredible potential to become an even stronger storytelling tool than it already is, but I think imposing limits forces you to be creative. Eduardo: I envision more interactivity from the user side. I think that the next step is a tour that asks questions of the viewer, so the viewer can actively answer these questions and engage the interface rather than simply watch the tour. Ari: I agree with Eduardo. At the moment, these tours are fairly passive experiences. In Google Earth, it’s possible to pause the tour or move the landscape around as the tour is unfolding, but there’s no deep interactivity that’s allowed within the tour. Going forward, I’d love to see ways for users to actually interact with the datasets. Ari: We set out to push this Google Earth tour to its aesthetic and narrative limits, and I’m really proud of what we’ve done. Now we’re trying to figure out how to do our next one. Jay Allison, Editor and Executive Producer. Ari Daniel has always been drawn to the natural world. 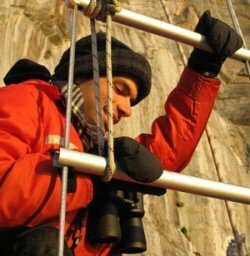 As a graduate student, Ari trained gray seal pups (Halichoerus grypus) for his Master's degree at the University of St. Andrews and helped tag wild Norwegian killer whales (Orcinus orca) for his Ph.D. at MIT and the Woods Hole Oceanographic Institution. These days, as a science reporter for public radio and NOVA, Ari records a species he’s better equipped to understand -- Homo sapiens. In the fifth grade, Ari won the "Most Contagious Smile" award. You can find more of Ari's work at his website. Eduardo Garcia Milagros is from Spain. In 2001, he finished his B.S. in Biology at the University of Murcia. In 2006, his wife received a Research Fellowship at the National Institutes of Health (USA) and they moved to Washington D.C. He started to collaborate with the National Museum of Natural History (Smithsonian Institution) as a volunteer. In 2007, he was hired by the Botany Department after showing them an idea about how they could use Google Earth to display information from the US National Herbarium. In 2010, he and his wife returned to Spain. He has been collaborating with the Encyclopedia of Life on a variety of projects, including a handful of Google Earth tours, since 2007. Great site and information. Some real potential here for bringing the audience one step closer to experiencing the story. Thank you very much, Kerry, for your note. Yes, we’re hoping that this storytelling format helps the audience feel all the more immersed in the experience of monarch butterfly migration and observation. I’ve always been fascinated by the multi-stage migration of monarchs, the incredible coding that lets four or five generations comprise one round trip from Michoacan to North America and back. 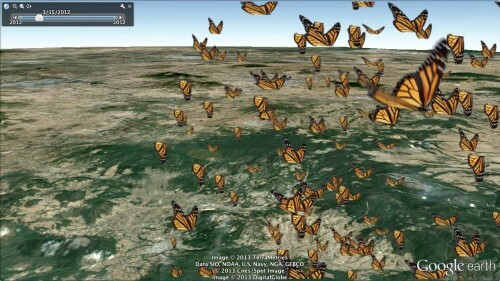 This Google Earth animation is the next best thing to flying along with them! Thank you, Flawn! Yes, I think that’s one of the most stunning aspects of their migration — that it takes multiple generations to complete a single migratory circuit. I’m glad you were able to take the aerial journey with us! The tour was fully developed using the free version of Google Earth. Some of the geographic features were created and/or modified using a couple of GIS programs: gvSIG and Quantum GIS (both are free too). Photoshop was also used to create some graphics. Josh’s graphics were animated using the KML programming capabilities in Google Earth. This is brilliant. I intend to copy the idea for bird migrations ASAP. Please keep us posted on your tours involving bird migrations! Wow! That was so very well done – all of the graphics illustrated the discussion perfectly – and the use of Google Earth was perfect! I’m inspired (so I’m hoping that others with more skills than myself will also be inspired!) to think of how to apply the idea with a whole slew of stories in Hawaii! Thank you, Michael! We’re glad that the integration of story and visuals worked so well for you. And we’d love to see what you come up with! This is wonderful! Very creative and well-done. Would love to work on a similar project with my students. Can I order a print out of the script? You should find most of the text that you need there, even though it’s not continuous. My third graders will love this tomorrow! Thank you for making this student friendly. It’s like an Imax for kids! The length is perfect. I’m very happy to hear that, Holly. We hope that your students enjoyed the experience!